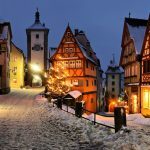 Rising up from the Elbe River Valley, Saxon Switzerland contains some of Germany’s most spectacular scenery – a maze of sandstone pillars, pristine forest, and intimidating fortresses. One of these was the Felsenburg Neurathen – built in the 11th century, it dominated the landscape for 300 years until burned by a besieging army in 1484. 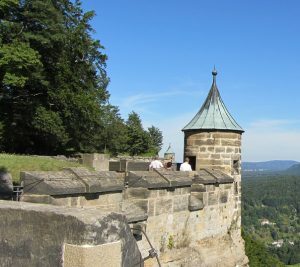 Sadly there is little left of the Felsenburg Neurathen that once sat on top of the natural stone towers. Bastei is the most famous rock formation in Saxon Switzerland, Germany. 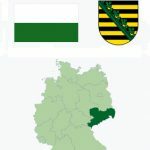 It is one of Germany’s most unique landscapes. The Bastei is a rock formation towering 194 m above the Elbe River in the Elbe Sandstone Mountains of Germany. Reaching a height of 305 m above sea level, the jagged rocks of the Bastei were formed by water erosion over one million years ago. 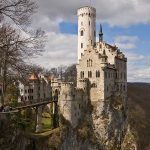 They are situated near Rathen, not far from Pirna southeast of the city of Dresden, and are the major landmark of the Saxon Switzerland National Park. 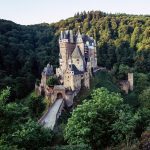 They are also part of a climbing and hiking area that extends over the borders into the Bohemian Switzerland (Czech Republic). 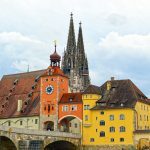 The surrounding area is so scenic that it was the site of Germany’s first landscape photography. 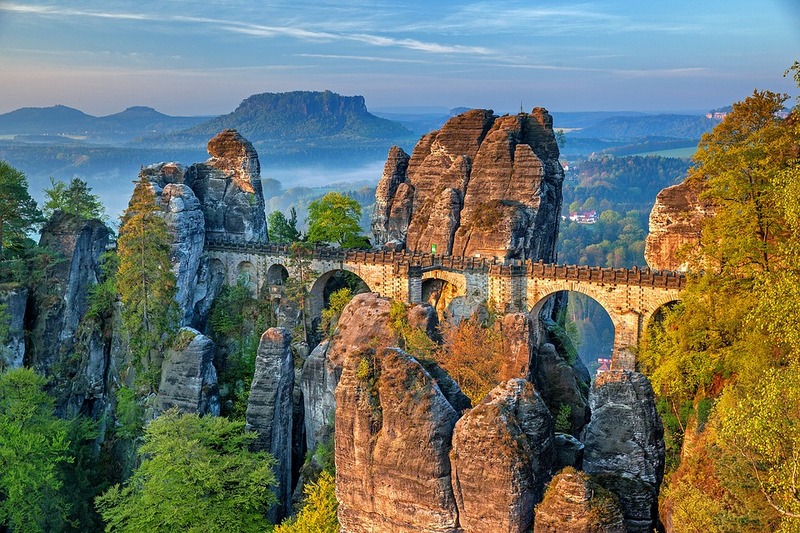 The Bastei has been a tourist attraction for over 200 years. In 1824, a wooden bridge was constructed to link several rocks for the visitors and by 1850 the original wooden bridge had been replaced by a permanent one made of sandstone in order to accommodate the increasing tourist traffic. 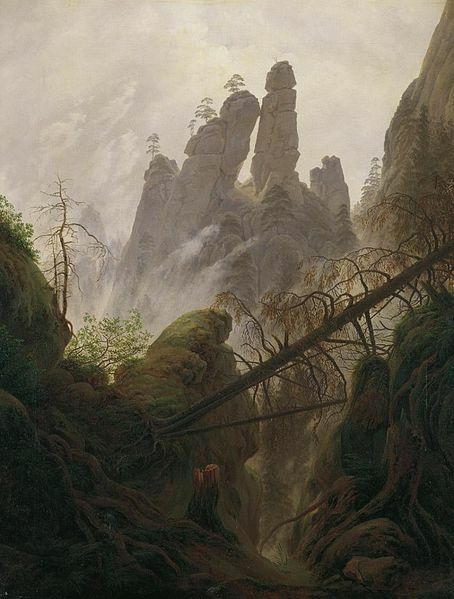 The rock formations and vistas have inspired several well-known artists, among them Caspar David Friedrich (“Felsenlandschaft im Elbsandsteingebirge”). The spa town of Rathen is the main base for visiting the Bastei. 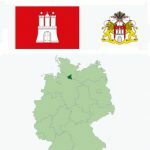 The town can be reached from Dresden by paddle steamer on the river Elbe. The name ‘Bastei’ comes from the word bastion, so it comes as no surprise that there’s the hollow ruin of Neurathen Castle at the Bastei Bridge, a castle that dates back to 1592. To begin with, the Bastei was only comparatively easily accessible from Wehlen and Lohmen. 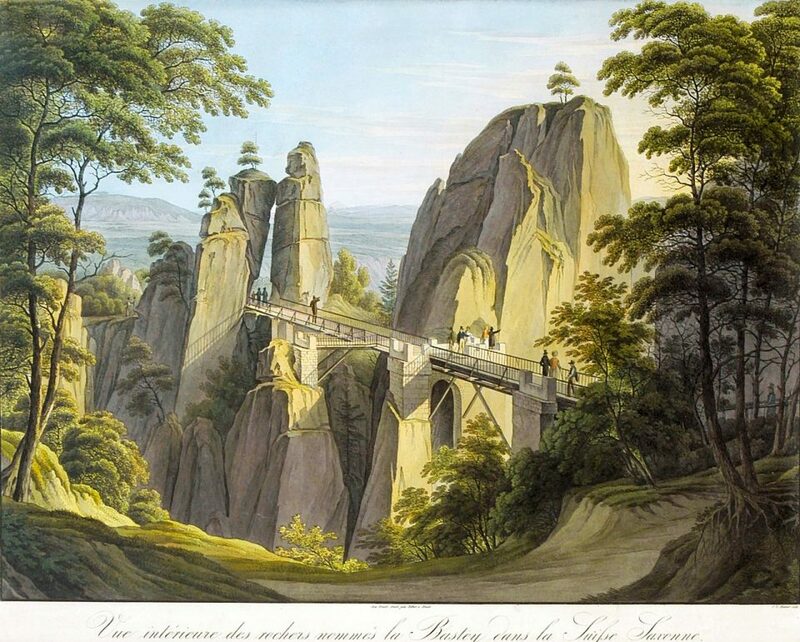 Numerous artists reached the Bastei over the so-called Painter’s Path, the Malerweg. Caspar David Friedrich painted his famous picture Felsenpartie im Elbsandsteingebirge (“Rocks in the Elbe Sandstone Mountains”) based on the Bastei. Ludwig Richter also sketched the Bastei. From Rathen, access used to be more difficult; but in 1814 a staircase with 487 steps was laid that climbed out of the Wehlgrund valley past the Vogeltelle to the rocks. At Pentecost in 1812, the Lohmen butcher, Pietzsch, started the first catering services for visitors to the Bastei. From two simple huts he sold bread, butter, beer, brandy, coffee and milk. Two years later a kitchen and a cellar were built below one of the rock overhangs and the lookout point was fitted with a railing. In February 1816, Pietzsch was given a licence to sell spirits; unfortunately the modest huts he had built were destroyed in a fire in September that same year. 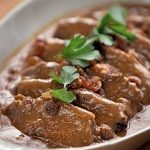 In June 1819, August von Goethe reported: “Friendly huts and good service with coffee, double beer, spirits and fresh bread and butter really revived the tired wanderer …”. In 1820, the spirit license went to the Rathen judge (Erblehnrichter), Schedlich. The development of the Bastei was given significant impetus in 1826. That year, the first solid inn building was erected with overnight accommodation, based on plans by Gottlob Friedrich Thormeyer. From then on the old huts acted as night quarters for the walking guides. The first bridge, called Bastei Bridge (Basteibrücke), was built of wood over the deep clefts of the Mardertelle, linking the outer rock shelf of the Bastei with the Steinschleuder and Neurathener Felsentor rocks. In 1851, the wooden bridge was replaced by a sandstone bridge, due to the steady increase in visitors, that is still standing today. It is 76.5 m long and its seven arches span a ravine 40 m deep. At the end of the 19th century, the Bastei finally developed into the main attraction of Saxon Switzerland. The existing inn was completely converted and extended in 1893/94. A high pressure water main was laid to it in 1895 and a telephone line in 1897. Around 1900, plans were laid for the construction of a mountain railway from the Elbe Valley to the Bastei, but these did not come to fruition. Even today a ravine southwest of the Bastei is known as the Eisenbahngründel (“Little Railway Valley”). At the beginning of the 20th century, the Bastei road was widened to handle the growing motorization. After 1945 the number of visitors increased sharply again, especially at weekends and public holidays, as the Bastei became a place of mass tourism. Between 1975 and 1979 the former inn was replaced by a large, new building, later a hotel. The Bastei is in Saxony National Park, 40km east of Dresden and towards the Czech border. 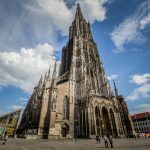 Even though there are day trips from Berlin, the best way of exploring this area is to fly to Dresden and pick up a hire car. It is only an hour’s drive from Dresden, though the landscape is so beautiful you might want to drive slowly to take it all in. 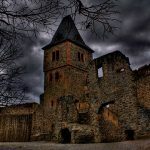 One stop along the way worth making is Königstein Fortress. This is a hilltop fortress built over 400 years ago, but it is the views that will really wow you. They are without a doubt some of the best you’ll find in Germany and it’s so easy walking around the perimeter of the fortress a few times. 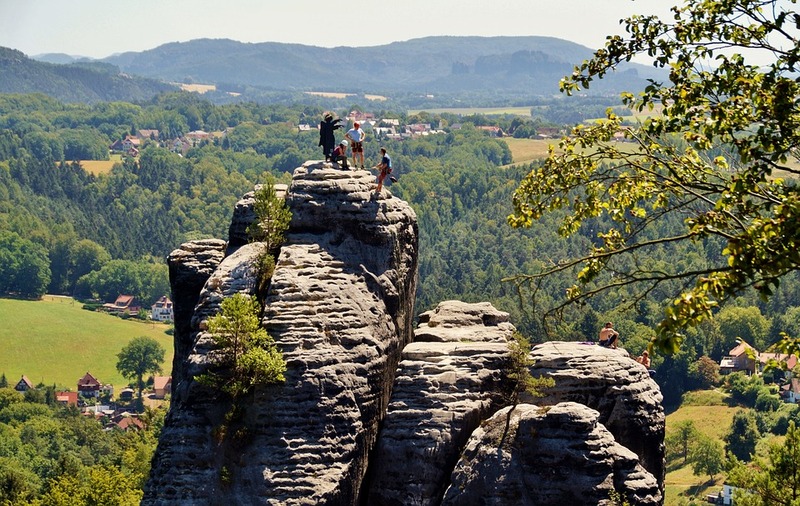 With the green rolling hills and numerous hiking trails in the area, the Bastei really is a must for outdoor enthusiasts looking for a very different hike. The best part is that it is Free! The national park is always open and free – all you need to do is pay for parking and a guide if you use one.